I have to say that this was my most challenging kite project. 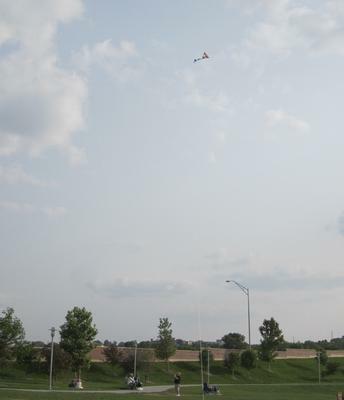 But more importantly – it was eventually my most rewarding kite project. My first attempt at flying the Tetrahedral turned to disaster with many crashes and keys locked in the car; which was indirectly related to my frustration. I thought maybe the wind wasn’t right, or that I had mis-located the tow point, so a week later I took it out again. Although this resulted in further spinning, crashes, and diving into the ground - to the point that I thought the kite was going to break apart. So, I knew that I had to turn to Tim to get some advice and any information that would help for a successful flight. Tim explained to me that a simple 4-cell tetra is right at the bottom edge of viability. Meaning that the mass/weight of the structure is at the high end (heavy), in comparison to the expanse of sail area to support it. He continued explaining that my flight success would be greatly improved by selecting the lightest thinnest skewers for the structure. It will make all the difference, Tim said, and it eventually did. After analyzing my first kite structure and design, I immediately understood that it was headed for disaster. I had built that kite using the opposite approach of what I now understood. My intuition had originally told me to use the sturdiest, heaviest skewers, as I thought they would be optimal for a solid and structurally sound kite. Boy oh boy, was that wrong - pretty much assuring doom. After this realization, I knew that I had only one choice. And that, much to my irritation, was to rebuild the kite using the lightest/thinnest skewers. Thankfully I was able to salvage the sail material which I had so diligently painted with some of my favorite colors. I took it apart so very carefully, trying not to tear the rice paper that I had used for the sails. Then I rebuilt the structure, very carefully selected each skewer by comparatively weighing them in my hands. Once rebuilt, the kite was amazingly light, and felt half the weight of the first version. I had put so much effort along with emotion into rebuilding this kite that I could hardly bear to test it – I would not be able to deal with another failure. With great trepidation, I carefully laid it in my car and drove once again to the park. 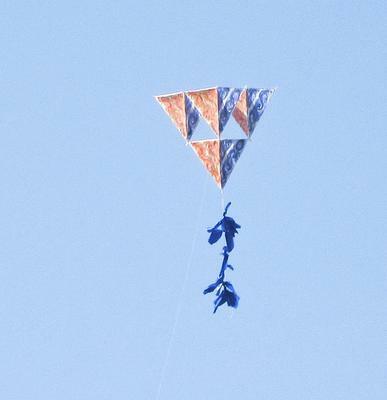 I was ecstatic when my re-made tetra immediately lifted into the air; rising beautifully into the blue sky. I could barely stand the excitement of seeing this kite smoothly sailing above. It soon became one of my favorites. I have flown it many times since my first successful flight with the second rebuilt version. It is beautiful and fun to watch – and best of all everyone is intrigued by it. I am not sure if my tetra required the substantial tail that I had attached (made in the bow tie style). It ended up twisting, and winding all over itself, although I think the tail did help with stabilization in the lower altitudes. But, the most important factor influencing my tetrahedral's successful flight, was reducing the weight of the kite’s structure as directed by Tim – Thank you! 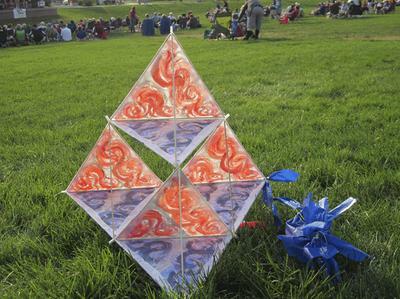 A kite story with a happy ending. Just as well after all that work! For a tetrahedral with many more cells, slightly heavier spars would be ok. 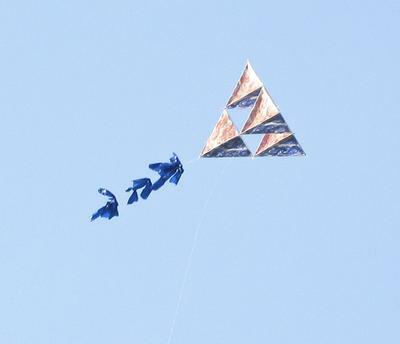 They would just allow the kite to stay up in rather stronger winds without failure. But on the marginally stable 4-cell design - definitely the lighter the better!